I was invited by Jack Clarke (Camberwell Unit 5 Co-ordinator & CSM FESP Associate Lecturer) to present a talk on the launch day of the written unit for the second year BA students in the design department at Camberwell College of Arts. Here’s the transcript and slides from the talk - approx 25 minutes. Thank you very much for the invitation today to present my talk titled ‘Participatory Speculation’. I’m a designer with a participatory design practice. Alongside my practice I curate a free programme for young people at the Design Museum, and I teach primarily on the BA Design course in the Department of Design at Goldsmiths University of London. I’m grateful to my colleagues and the students at Goldsmiths for discussions that have helped me to formulate some of the ideas I will discuss today. 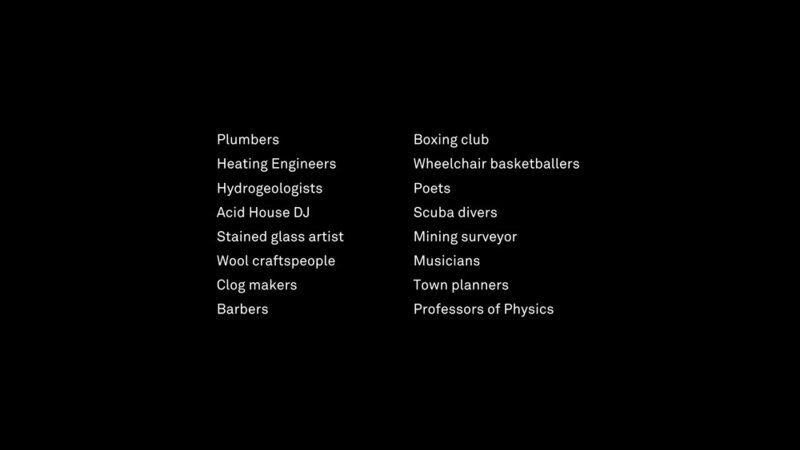 As part of my practice, I work with many people who range from heating engineers to clog makers, and acid house DJ’s to town planners. And later I will discuss the relevance of my practice to working other people from different disciplines, and the opening up these disciplines. Grounding my practice is a model that I’ve called ‘Participatory Speculation’. This involves using knowledge generated through research about a context — people, cultures, materials, histories, industries, infrastructure — and then re-configuring this with the relevant people to speculate on alternative possibilities for that context. A series of disclaimers and notes before I continue: Everything is discuss is a proposition, nothing is dogma. This isn’t a ‘how to’ guide, it’s a series of models that act as anchors to discuss learning generated through a specific project. Though I will only refer to myself in first person during this talk i.e not as the designer, the aim is that this talk is applicable to wider design discourses. Defining or setting assumptions is a technique for opening a talk that I’ve borrowed from Matt Ward - Head of the Design Department at Goldsmiths University of London. I’ll use it to quickly frame my understanding of design before I continue. It’s taken from an interview between with Madame. 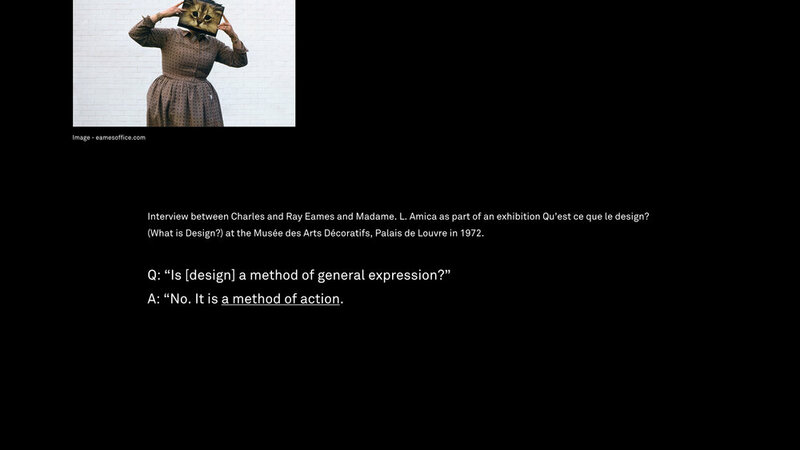 L. Amica and Charles and Ray Eames, as part of the exhibition Qu’est ce que le design? (What is Design?) at the Musée des Arts Décoratifs, Palais de Louvre in 1972..
Charles and Ray Eames: “No. It is a method of action." I’m going to start by discussing a specific project I’ve done and this will be referred to throughout. It’s titled ‘Cosmic Colliery’ [welsh translation - Glofa'r Gofod], and it happened whilst I was a designer in residence at the Design Museum in 2015. Through this project engaged ex-mining communities in the Rhymney Valley in South Wales, with the possibility of their local abandoned Penallta Colliery becoming an underwater astronaut training centre. 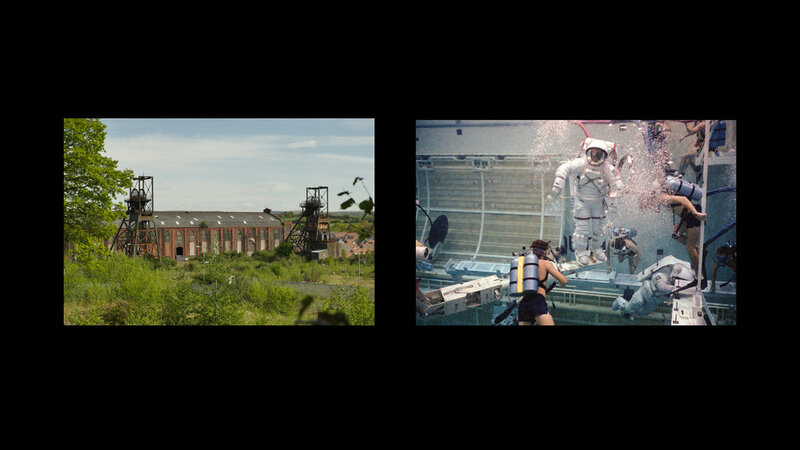 Through a combination of performance-based activities and interviews, I engaged with people and communities surrounding the colliery and through a short film, I documented the aspirations and tensions that had arisen in the pursuit of an astronaut training centre. The film is available to watch on my website. 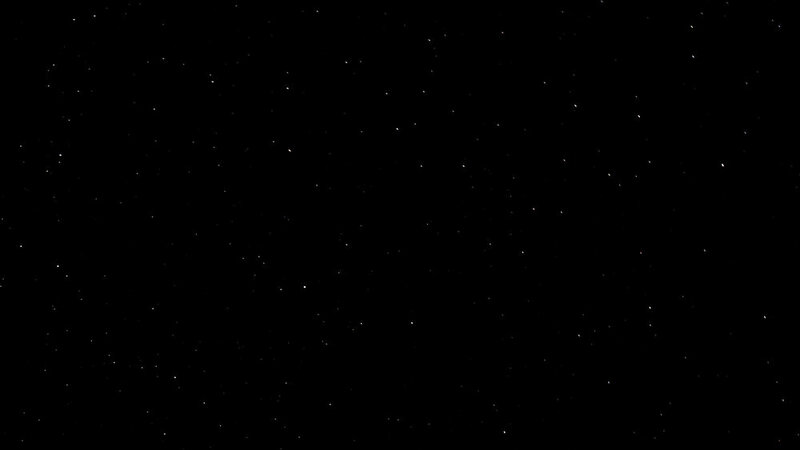 The project was a continuation of a previous project titled the Welsh Space Campaign, and it started with these two images here. Penallta Colliery and NASA’s neutral buoyancy lab. NASA train their astronauts in deep pools of water. When they get to a certain depth, they don’t float up or down, they reach a point of neutral buoyancy. It’s the closest thing on earth to being in space. So the initial idea stemmed from how the underground shafts of a colliery could be used as neutral buoyancy chambers for astronaut training. Acknowledging as a community, that this thing likely will never happen. I wanted to work together with them to take a really big idea and figure out what if there was a collective mindset to be able to achieve something like that. I worked with many different people & groups in the town, from barbers to historians, and ex-miners to choirs. The group I worked with most during the project was the youth club in Ystrad Mynach. One of the activities involving them was to bring them on a minibus to a local swimming pool to take part in activity that involved learning Russian and Scuba diving - if you’re going to go to space, you need to be able to communicate with the other Cosmonauts, and the Scuba diving relates to Astronaut training. 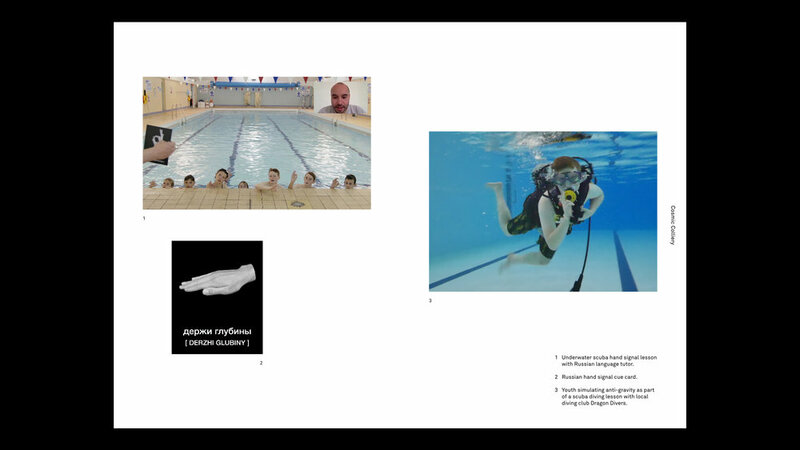 A Russian friend of mine was set-up on a Skype at the side of the pool, running a Russian underwater sign language lesson, simultaneously, a local Scuba diving club called Dragon Divers were running an activity taking the young people through the process of learning to Scuba dive and communicate with each other underwater. Other parts of the projects involved working with different groups of young people. The top right image was an activity with a class from a primary school that’s directly behind the colliery, which involved making their own protest signs for alternative possibilities for the colliery - a direct reference to the picketing at the colliery involving many of their family members during the miners' strike between 1984 and 85. The other activity involving the school was about taking their ideas through local planning processes as a means to give recognition to them. The schoolchildren drew proposals for other possibilities for the Colliery, focusing on the idea of astronaut training. I then arranged a meeting with Patricia Martin, Conservation and Town Planning officer for Caerphilly Council, to take the proposals through a legitimate process. And of the many other activities that took place as part of the project, this one again involved working with the youth club in Ystrad Mynach, specifically, with the President of the club and prominent Welsh historian Dr.Elin Jones. She’s somebody I admire greatly, and during the different times we met, we often talked about the Colliery in it its current form, her relationship with it as somebody that was raised in the area, and the Colliery’s significance to the local area. Through our discussions, we also discussed the rich socio-political history of the area, specifically the Chartists. Chartism was a working-class movement that emerged in 1836. The aim of the Chartists was to gain political rights and influences for the working classes. Chartism got its name from the formal petition or ‘People’s Charter’ that listed the 6 main aims of the movement. I was interested in how the young people could be engaged in the rich socio-political history of the area as a means to engage them in current socio-political issues. This involved arranging a meeting at the top of one of the Colliery pit heads, so directly beneath the table is the now sealed shaft that would lower miners into coal pit. The aim of this meeting was for the young people to work together to write their own six-point charter or manifesto for the Cosmic Colliery. The points they created addressed ideas of access, wealth distribution, rehabilitation, and welcoming others. One of their points reads ‘Whoever has a criminal record should have access to the centre to make a positive change and not be miserable for the rest of their life’. The aim of this meeting was to engage them in an easily replicable process. A process of discussing their ideas and debating, which they can then apply to addressing other local and wider issues. The way I’ve just described this project mainly just addressed what happened, I didn't mention intentions, strategies, implication, and effect of engaging people with alternatives - all of which are essential to consider when doing participatory projects, all of which I will now address. The projects I do have a strong social focus and relies on designing situations and artefacts with people. 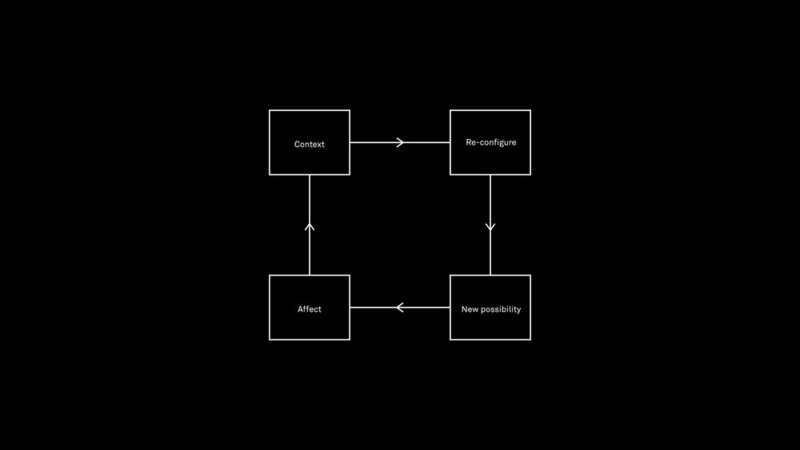 This means my design process is informed by interactions, not predictions, and the conversations with the people I meet directly influence what is produced. Therefore the first adaptation of this model is to explore ideas of how intentions are formed. Contained within a context are people, politics, economies, communities, micro-communities, cultural practices, activities, infrastructures, materialities, skills, histories, expertise, needs, desires, values and so on. This context also exists within broader political, economic, social, cultural, technological, environmental contexts - all of which inform my intentions for the project. Education in its different forms, institutional, familial, and experiential, all affect the designer. Ethos, knowledge, critical thought, a love for world, experiences, and failures shape my intentions. There were some specific factors that informed the overall intentions for Cosmic Colliery. The constituency that the project took place in had the lowest percentage of voter turnout in Wales during the last general election. This data seemed as though it’s in stark contrast with other factors I understood from an outside perspective such as it being a resilient community; Penallta Colliery was the last mine in Wales to close in 1991. 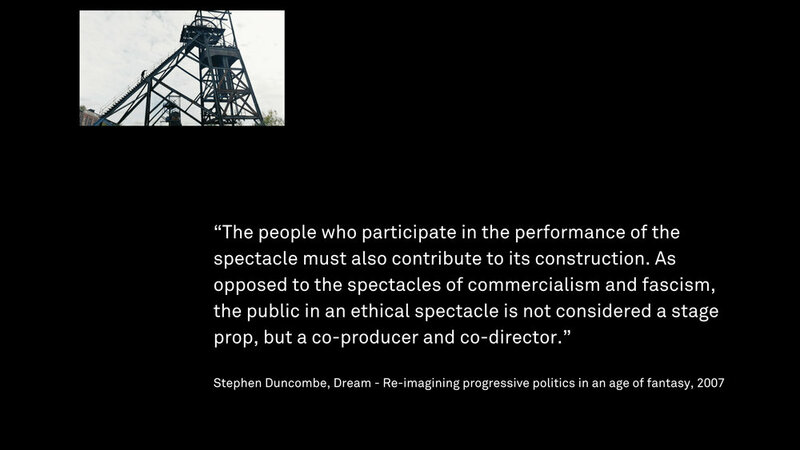 As a result, I was interested in how the act of collectively imagining could be a way to explore people’s ambitions for the future of the locality; specifically, after a generational tradition of young people going to work in the colliery, what was the perception of young people as potential agents of change for themselves and their locality? How did I take action in response to the above intentions? 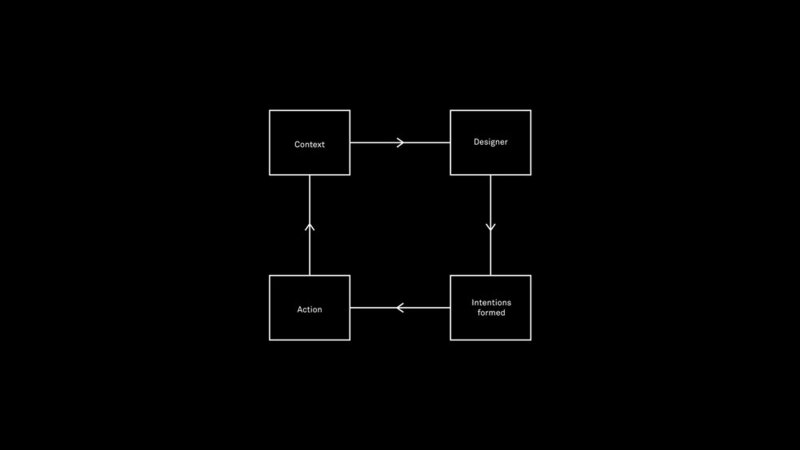 If design is framed as a method of action, how do we direct bring about that action? A method of action through methodical actions. Strategies, techniques, methodologies, skills are all important when realising an appropriate action. In relation to Cosmic Colliery, I would always be asked, why space? I’ve never wanted to go to space. I’ve never dreamed of becoming an astronaut. Space is the most distant context from our terrestrial environment. Because of this, it is an effective tool for the act of imagining alternatives. “A person can be awestruck by something which is clearly dangerous and threatening. This is, of course, the central insight of hundreds of years of writing on the sublime, recently translated into questions of technology (including Apollo) by David Nye (1994). More recently still, the sublime has become rather politicised, with a variety of authors claiming that it represents a sort of gap in understanding that open to radical change (Shaw, 2006). In other words, whether witnessing the towering mountain peak, or the Saturn V [rocket] on a pillar of fire, the contingency of the everyday is exposed and (for a while) the world doesn’t look quite the same. This is the sort of opening that many commentators have also found in science fiction, as a sort of longing for the world to be otherwise that it is (Jameson, 2005). So any form of alterity, whether expressed in terms of great distances in time and space, or objects of great power of size, might do enough to displace the observer from common sense, and allow them to see the world differently”. The performance of actions that exist in space or actions in preparation for space, allows for the simultaneous occurrence of the existing context and a new possibility for the context; making a familiar context unfamiliar as a means of creating a new relationship to it. The different actions, from the cosmonaut underwater sign language lesson to a zero-gravity haircut, were all loosely planned according to this framework defined by Thomas Hirschhorn. The action, methodically produced, is an actualisation of my intentions. As the action is delivered to the context, people project values, subjectivity, and experience onto the action. The porosity of the action is important because it affords me and the person involved an equal amount of autonomy within the creative process. Creating enough of a framework for people to have the freedom within it to contribute towards the process. Relevant to this is Roy Ascott’s notion of cool artworks. The person involved will contribute more to the process because they're the expert and this affords them much more freedom during the process. The more they can contribute, the more authorship the person involved has, and the more they’re able to speculate on alternatives. Relevant to the type of of participatory/social practice being discussed is this quote from Artificial Hells, written by Claire Bishop. Even more relevant to the project in question is this from Stephen Duncombe. What’s the role of the designer in this process of opening up alternative possibilities? However, friction and disruption and not always welcome, therefore there’s an unaddressed question of who’s allowed to be the idiot or outsider cultivating alternatives? Whilst growing up near Cardigan, West Wales, I would regularly accompany my dad to the building merchants. Unlike him, I wasn’t there to buy bags of concrete, lengths of timber, or decorators caulk. I would walk around the timber yard and inside the shop without a purpose, looking at and trying to understand the things around me without the builders’ lens. However, I was only allowed to behave differently to other customers and play there because of my dad’s invitation. The brings me to a current interest, the notion of the ‘Invited outsider’. Conducting yourself like a business in a small town. This doesn’t mean that you should forgo having a critical voice, it means that you shouldn’t be antagonistic; I’m advocating an agonistic approach as articulated by Chantal Mouffe & Markus Meissen, but predicated upon an invitation. Ken Pritchard was a volunteer club leader of the youth club I worked closely with in Ystrad Mynach, and I’m grateful to him for welcoming me and introducing me to meet different people and groups who then became involved as a result. Accountability also suggests an ethical consideration. 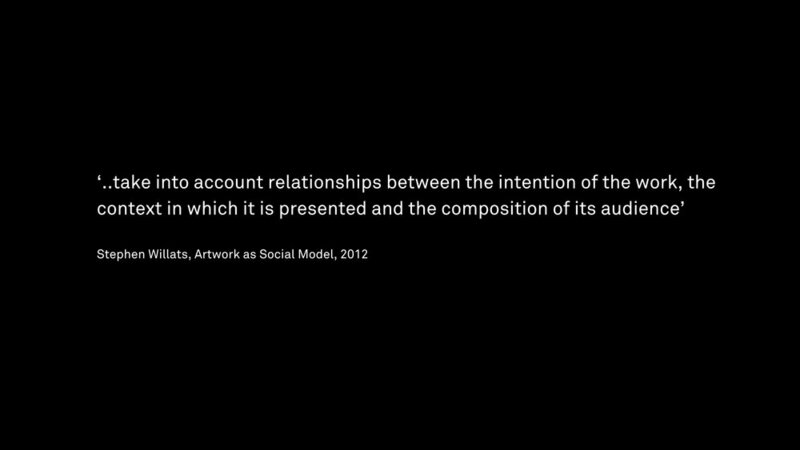 The work should ‘..take into account relationships between the intention of the work, the context in which it is presented and the composition of its audience’ Stephen Willats, Artwork as Social Model, 2012Many of the diagrams in this talk derive from Willats book ‘Artwork as Social Model’. There are ethical implications when proposing something new. Interpretation is a large factor in this, to refer back to the earlier quote from Roy Ascott, people will project their “own sense of order or significance into the work”. And depending on the context the project is taking place in, interpretation can enable people to both take ownership and create unrealistic expectations that could be potentially unethical with regard to the designers' responsibility. I've been completely transparent with the community through always introducing the project as something which I alone am not going to make happen, and it’s something that likely won’t happen. Instead, I would always stress that this project is about the process of speculation, of suspending disbelief and engaging with their locality and the future of it in an unrestricted way. The context, now affected, is re-evaluated by its constituents. And a new possibility is considered. The following extracts are from interviews that were held by a BBC interviewer with the participants of the project a year after the project had ended; conducted as part of a BBC Wales radio documentary about the project titled ‘Wales in Space’. The aim of reading these is to use the experiences of different people involved in order to briefly summarise what I’ve discussed so far. Keith Pritchard - "When he first came here and started talking about Cosmonauts and all this, I thought he’s crazy, I thought there’s something wrong with him! But it was so interesting that I started to believe something could happen." Elin Jones - "I very much hope that they’ll be a chance to use the Colliery buildings and the shafts and possibly the underground workings in a way which fits in with the 21st century, and gives us a chance to take possession of our heritage, of our environment and make it ours and part of a Wales of the future. Not a Wales of the past, not a Wales of exploitation and victimisation but a Wales of positive development of sustainable development of hope and of belief in ourselves." Ian Raymond - "I thought us adults can learn a lot from our children." 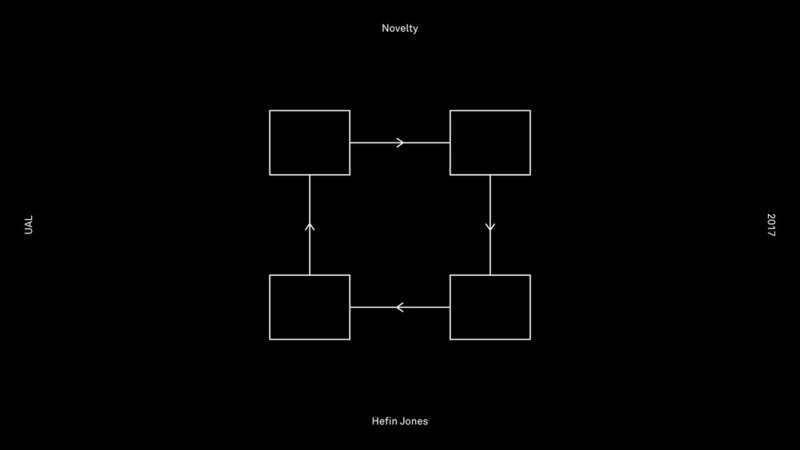 Maintaining an action, or, cultivating novelty. 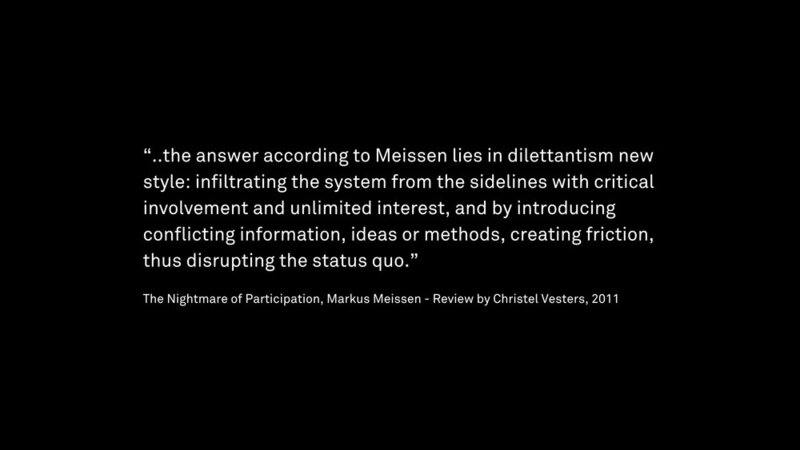 It’s important the consideration for how alternatives are cultivated is established at the point of the intentions being formed. During this project, I was fortunate to have a regular dialogue with Onkar Kular. Though I couldn’t immediately articulate the best responses, his provocations motivated me to be more rigorous and take into much more consideration the implications of what I was doing. As a result, I was then able to design the appropriate actions in the project because it was happening over four months and was constantly being informed by interactions with people and groups in the town. However, make no mistake, this project is by no means perfect and it had problematic elements which form the bulk of the learnings articulated in this talk. The project is primarily pedagogic and the intentions relate to that. I’m not actually trying to make this astronaut training centre happen, but instead, through the different actions that occur as part of the project, I’m intending to cultivate relationships between young people and others in their locality so that the young people have a more effective means of exercising their agency. 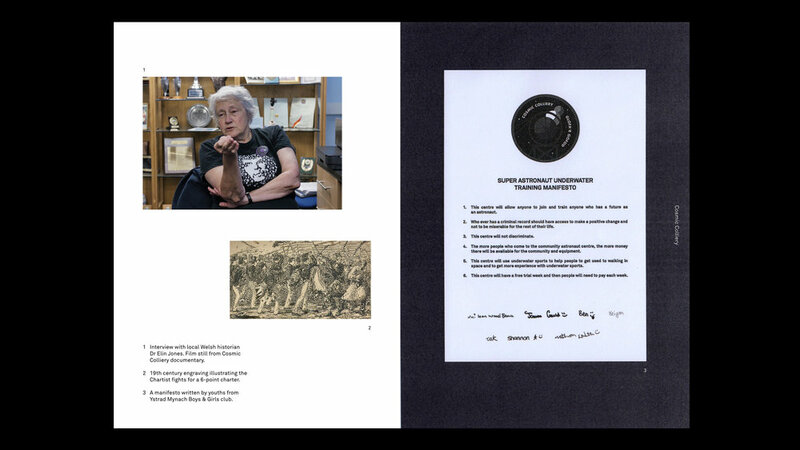 This involved the creation of networks through the process of participatory speculation. Through doing so, I aimed to calibrate the existing local groups towards a meaningful engagement with the young people and their ambitions. To conclude, intention, action, and effect should formulate a coherent process, methodically conducted by the designer when involving people in designing alternatives; I believe this also to be applicable to other design practices. An argument against this could be that sometimes you will only know what you’re doing through initially not knowing. 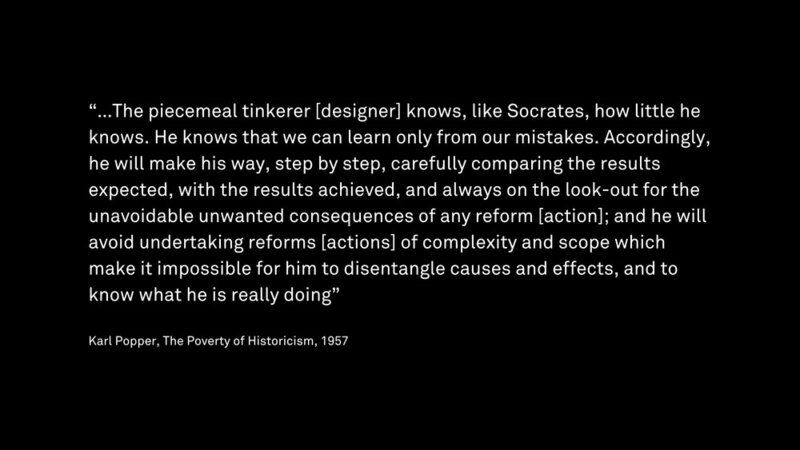 This is more often than not true, however, I believe that Karl Popper addresses it here through framing not knowing as a controlled act; an action carried out by the designer that is able to be unpicked and understood later. Being able to disambiguate the effects from the cause is a necessary function of participatory projects as it allows the designer to get to the point, perhaps through many iterations, of knowing what they are really doing.